“Imagine a time in the future when your mind might travel. Perhaps it would enter a different torso or a foreign face. Would you still possess the same self, the same being? Our minds, most of us would agree, define us; they carry our personhood, and where they go, we go too. In Western culture, much depends upon this belief; it underpins a great deal of our literature, art, politics, and jurisprudence. It is the foundation of the commonsense psychology so crucial to social life. The concept of the mind is everywhere, and yet at the same time, it is strangely nowhere. The most powerful arbiter of truth in contemporary life, natural science, refuses to ratify this belief. While our own psyches seem abundantly clear to us, attempts to objectively establish their existence have been mired in seemingly insoluble problems. And so, while the mind remains central to 21st-century Western thought, a number of prominent neuroscientists and philosophers inform us that it surely does not exist. Soul Machine is an attempt to untangle these contradictions by returning to their origins, the beginning of the modern age, when religious beliefs, philosophy, medicine, science, and political power were all in flux. The emergence of the mind as a formative, if always embattled, belief, cannot be understood outside this historical context; it was never the result of a timeless debate in which Plato, Kant, and Wittgenstein argued over dinner. Instead, this book recovers a lost lineage, parts of which have been long discarded as embarrassing, wrongheaded, or irrelevant. This collective forgetting has led to impoverished, skewed discussions among different specialists, and no broad, historical account of how the modern mind emerged. This book is a great journey, I imagined you writing it, and getting more and more excited in a certain way. A sort of “can you believe this one” as new ideas came forth. I found myself thinking about two main points that I will try and outline here. 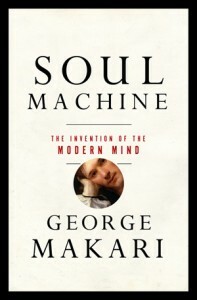 As a prequel to Revolution in Mind, Soul Machine looks at the social history of the mind. You ask what it took for this idea of the mind that we have today to develop. You show us the social context, the way power matters, the way the mind did not emerge as an idea outside of the context within which we thought about it. We began with what I might call an all encompassing “big tent” theory of the mind, whereby the mind was both real and material, supernatural and divine, formed from external perceptions and internal dispositions. You then show that what had to be thrown out again and again seemed to be this part of ourselves that we can’t explain. Yet there is never a way to really link up the material basis of the mind with the mind as we know it. That switch that leads from the material to self consciousness remains elusive. Even today while we can show how the mind can be disrupted by matter, we never show how it is created by matter, how the matter we have leads to the mind we know. In this history, we take for granted our sense of an interior, thinking, self reflexive mind. An interiority where I have a private self, a thinking mind that you can’t know, and which other entities (supernatural or “other”) do not enter. Our thoughts need to be broadcast through speech and cannot be known in another form. I am obviously not talking here about unconscious to unconscious communication – that comes later and in some ways contradicts our general lay model of the mind. This composite of mind and selfhood was reinforced by religion and built on a Christian model of self elaborated by St. Augustine, emphasizing individual intention and emotion. For anthropologists working today on Christian conversion in what we might call “far flung” places such as Melanesia, this Christian priority becomes obvious. In these cases the striking change is not the newfound belief in god, but rather the development of a whole different kind of mind that thinks, has feelings and is bounded. This Christian version of mind is private except to God, and the secular version is by extension similarly private. As you have shown, even our modern secular minds are underlaid by a Judeo-Christian ideology of self, continuing to embody a religious past even if we have dethroned God as the proxy of religion. If we accept the premise of the interiority of the mind, dreams are not prophetic or communications, they are expressions of self. The self is no longer realized through adherence to ideals and ideas (the Greek self) but through self realization. Madness is no longer supernatural but a failure of reason or a surplus of passion, depending on the prevailing theory of mind. Of course today we can see madness as the etiological certainty of a biochemical imbalance manifesting a preconditioned or genetically encoded destiny. Yet speaking as an anthropologist, it is worth noting that many models of mind diverge from this uniquely Western construction of a self possessed mental agency. In other cultures there is no sense of a bounded or private mind. 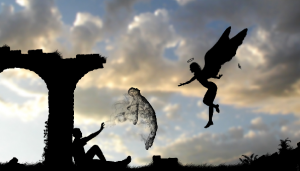 Spirits can still pass between people. The speech act is equal to and not separate from thinking itself. These cross-cultural variations have interesting implications for the diagnosis of schizophrenia as certain assumptions about the mind and the role of language break down to give way to new understandings of mental formations. You have written a glorious history of the mind in parallel with a robust history of medicine. But my question is, by taking out the idea of the soul, what have we lost? Souls do not have to be understood through theological doctrines. We could acknowledge the soul without having to endorse these doctrines. Not everything that is real is material. If something affects how we understand ourselves to be in the world then it is real. Perhaps this is just culture, but perhaps this is also the soul. Indeed in some cultures the phenomenology of depression is described through the idea of Soul Loss. You have shown us a very particular fight over the nature of the scientific mind, but one wonders what this would look like if you had begun with the soul. What if, rather than relegating the soul to a religious or supernatural space, we allowed it to be the non material reality that we believe occupies us. Natural science and the enlightenment have led us to this place where we have excluded the non material and sequestered it to religion or philosophy, to create a materially based mind which is usually described with the latest technological metaphor of the day (hydraulic, computer etc.). So I wonder how you might have written the history of the soul. I realize that was not your aim, but I would say that probably most of the world believes in a soul, outside of a scientific elite. The soul is what we recognize when we see the other as a center of their own life, and not as a robot. It is what makes me different from you and anyone else. It is what joins you when we merge in the sexual act of mother and child. It is an idea which we might use language to express in different ways, as transcendental ego or spirit for example. What would a book look like that contextualized or historicized the mind alongside the soul? It was not just the mind that became modern, but also the soul. By extracting the modern soul and subsuming it within a genealogy of the philosophy of mind, we have lost something from the writing of our medical history. You demonstrate the competing discourses of mind which run in tandem with scientific revolution. In this sense you are writing a social or intellectual history in the context of individuals who saw themselves as making a truth claim about the mind. In the clattering of ideas and voices one sees that such truth claims rise and fall. Clearly it is not the isolated ideas that are important but rather the trains they ride on. The context within which these claims are made is as important as the claims themselves when you attempt this sort of intellectual history. Yet if we take your book seriously as not having an end point, as showing us the heterogeneity of discourses, then we are of course only left with the Foucauldian sense that power and knowledge are always interrelated, and that the idea of truth becomes problematic. How can we proceed to reconcile this extensive historiography with the stakes of our current moment? It is quite obvious that our theory of mind essentially has the power to alter our mental experience. As clinicians, how do we work with this knowledge? What would you want clinicians to consider in terms of their clinical work and perhaps even more important, how can we intervene in knowledge and its production and transmission? The era of specializations has allowed competing discourses to never have to talk to each other. To overcome this divisionism, medical curriculums should begin with a year of coursework on the philosophy of mind, especially to the extent that the concept of mind necessarily entails a “soul machine”. This seems particularly relevant to the study of psychiatry, or any discipline seeking to address the question of a mind “out of sorts”.